Ivory Bill or Regular Bird? Today I spotted a huge woodpecker in my neighbor’s yard. It was high in the pine tree hammering away at the bark and trunk getting some dinner. The tack-tack-tack was loud. I looked up and saw a bird the size of a crow rotating around the tree’s girth, dancing in cylindrical fervor as only a hungry woodpecker can do. And then something clicked in my head that this was the rare ivory bill woodpecker. So I dashed inside to get my binoculars. Peering through the lens I saw its red headdress and white markings and my heart fluttered. Can it be? Is it?! I ran back inside and called the Louisiana Wildlife and Fisheries office and got a voice mail recording. I called the Audubon society and got no answer. I Googled up other groups and no one was home so I called back the LAWF and got a nice woman who said that it might be the pileated woodpecker. Take a look at how close they are in design. 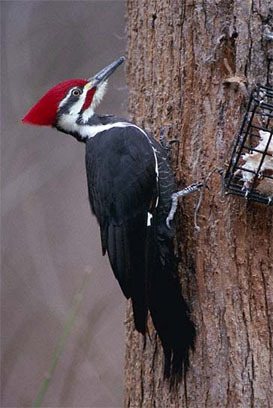 This is the Pileated woodpecker. This is the Ivory Bill woodpecker. Unreal. They look exactly alike except that the Ivory Bill of course has an ivory bill and more white. I didn’t get enough time to investigate him before he flew off. I’ll be looking for him again when I hear his insect-gathering hammer going off. Till then I’ll dream of new discoveries and better eyes. ~ by ostrakinos on December 28, 2007.